Welcome on board Captain Cook Cruises "Murray Princess" - the southern hemisphere's largest inland paddle wheeler. Sail down the mighty Murray River for a cruising experience you'll never forget. One of the worlds longest Rivers, the Murray covers one third of Australia's continent across Victoria, South Australia, Queensland and New South Wales. 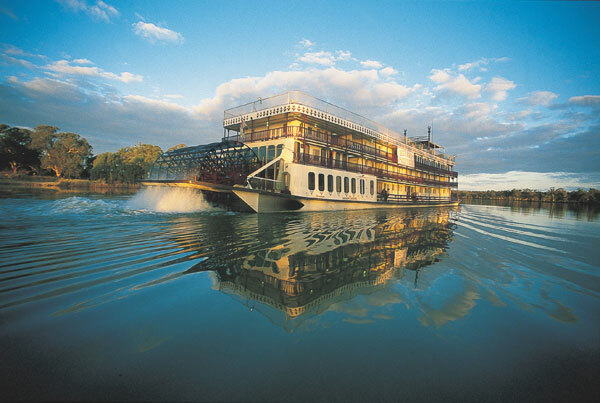 Cruise this iconic Australian outback river highway on a Murray River Princess Cruise. With dramatic scenery, you can discover some of Australia's outback in the luxury of your own private Cabin or Stateroom. With overnight 3, 4, 5, 6, 7, and 9 day river cruises to suit your desires Captain Cook Cruises also caters for those with mobile disabilities / limitations. Cruises with Captain Cook can also include pre and post Hotel Accommodation in Adelaide to make your holiday or vacation booking even easier to organise. Crazy Cruises caters for both the Early Bird and Last Minute River Cruise bookings - so be quick to ensure we have space for your Murray River Cruising experience without further delay.